This month’s Hot Press carries a piece written by a barman at the Galway hotel where Brian Cowen was alleged to have spent the night drinking prior to his infamous interview on Morning Ireland in 2010. 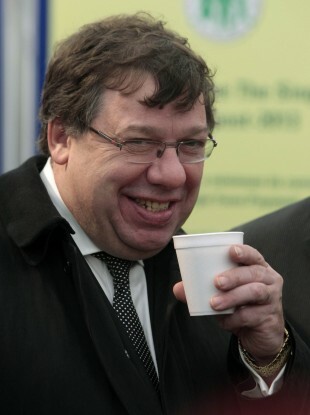 IT HAS GONE down in Irish political folklore: the morning Taoiseach Brian Cowen was allegedly drunk or hungover or both during a set piece interview with RTÉ’s Morning Ireland. Since then much has emerged about what happened that night in September 2010 before that morning radio interview at the annual Fianna Fáil think-in at the Ardilaun Hotel in Galway and just how much alcohol the then Taoiseach did or did not consume. Cowen has always denied that he was either drunk or hungover on air but that hasn’t stopped the stories emerging from the night in question largely because of his performance in the interview and the Taoiseach did later apologise for his performance. Cowen sounded hoarse – Fianna Fáil blamed congestion – and briefly confused the Croke Park Agreement with the Good Friday Agreement . Now a senior barman from the hotel, Ivan Murray, has written in Hot Press magazine about that infamous night. Murray writes about how he brought back a packet of 20 Carrolls and was tipped €1.50 from the €41.50 change. By the time the assembled throng were called for dinner, as the one who was dishing out the drink, I’d estimate our glorious leader had sunk something in the region of seven or eight pints of stout and a few gin and tonics. Murray writes that Cowen was “mixing drinks with gusto” having switched from wine to lager during the dinner. I can say that I personally continued to serve Mr Cowen, and most of the rest of them copious amounts of alcohol all evening and into the early hours of the next morning. Fianna Fáil has declined to comment. The full article from Ivan Murray is in this month’s Hot Press magazine. Email “Cigarettes and alcohol: New details of night before THAT Cowen interview”. Feedback on “Cigarettes and alcohol: New details of night before THAT Cowen interview”.